When the X-series of mirrorless cameras from Fujifilm launched last year, it began with three prime lenses: an 18mm f/2, a 35mm f/1.4 and a 60mm f/2.4 Macro. This gave the system a nice base to start with, and provided three very high quality primes for the serious photographer. Later last year, Fuji expanded the line by adding two much-needed pieces: An ultra-wide prime and a standard zoom lens. With the bar set so high with the first three lenses, there were high expectations for the new lenses. Here, I’ll take a look at that ultra-wide prime: The Fujinon XF 14mm f/2.8 R. At $899, the XF 14mm isn’t a cheap lens, but it’s certainly not ultra- expensive for a pro-grade ultra-wide angle. Let’s see if it’s good enough to deserve the price tag. 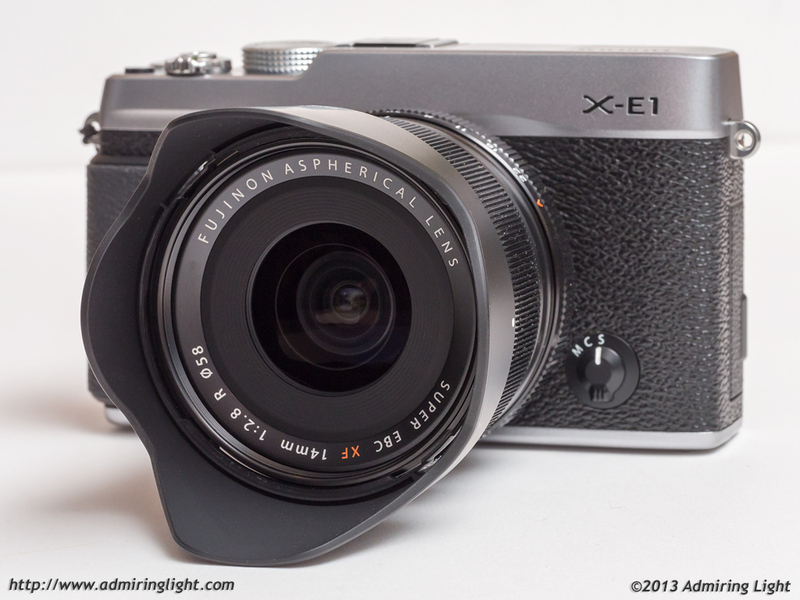 Like all of Fuji’s lenses for the X series, the 14mm f/2.8 is a very solidly built lens that has echoes of the tank-like build of lenses from the 60s. The lens is entirely metal on the exterior and is based on a metal mount. The focus ring is broad, ribbed metal, and has a focus clutch mechanism to switch between manual focus and autofocus. When the ring is forward, towards the front element, the lens is in autofocus mode, and the focus ring can’t be moved (this also allows a solid section to twist the lens off and on the camera). When you pull the focus ring back, a focus distance scale is revealed, to work with the always visible depth of field scale. You can then use the lens in manual focus mode. When in manual focus mode, the focus ring is well damped and smooth, though mine makes an audible swoosh sound from the focus ring moving against the lens body when focusing. XF lenses I’ve used are nice and solid. The one on the 14mm can actually be shifted up and down. It just seems to be about a half a millimeter too large for the body. Another frustrating thing is that it seems that there is no actual detent at f/2.8…it just sits there when set to that aperture, making it extremely easy to knock from f/2.8 to f/3.2. It’s an unforunate build issue on an otherwise extremely solidly built lens. The Fujinon 14mm f/2.8 is not a small lens, nor is it huge. It’s bigger than many mirrorless lenses (and far larger than something like the Olympus 12mm f/2 for Micro 4/3), but it’s still quite a bit smaller than a 21mm f/2.8 ultra-wide for full frame. Ultimately, the size and weight balance well on the X-E1, and it still fits quite well in my small bag that I use for my Fuji kit. The 14mm f/2.8 has rather quick autofocus. I’m sure part of this is due to the shorter travel an ultra-wide lens requires, but among the Fuji lenses, the 14mm f/2.8 focuses among the fastest. It is also very accurate. I have not had some of the focus failure issues with the 14mm as often as I have with some of the other Fuji lenses. It tends to focus quite quickly and surely. While not a macro lens by any means, the 14mm is capable of focusing very closely, to about 7 inches from the sensor plane, which is about 4 inches in front of the lens. Amazing review! I really love the street photography images people are getting with this lense also, very nice focal length. Have you tried some people shots with the 14. I’m a very happy a Fuji shooter and the 14 is a winner. However, I would like to point out the build quality is nothing like lenses produced in the 60’s. Its good, loose aperture rings and all. But 60’s good, not a chance. I still have 4 old Nikkors and Minoltas sitting around and to suggest any of my 4 Fuji lenses are built as well is dreaming. Well built means silky smooth operation after 40 years and a few lube jobs. It means focus and aperture rings that don’t wiggle and have firm but usable movement. It means lens mounts that have no free play and go on with a smooth tight twist, not a scratchy loose movement. Giving people the impression that these lenses are mechanical marvels is unfair and misleading. Nor is it necessary as optically they are excellent. Perhaps they are competitive but to an extent not worth pointing out. My newer Nikons (now history) were as well built or better with a more refined operation. Plastic and all. Great review! I just ordered my X-T1 body only, but I cannot decice what will be my first fixed lens. I really like landscapes but I think the 14mm would be a bit limiting for me as long as can buy only one at the moment. Should I go for the 23mm instead? Hi Jordan, thanks a lot for your wonderful reviews. May I ask an advice from you? I need choose 1 lens from 14/2.8 and 16/1.4. I think 16/1.4 is more useful during street shots, but 14 is wider during landscape shots. But I don’t know how big difference between 14 and 16. For me, Street shots and landscape has equal frequency. Guess you know these two lens very well, hope hear to your idea? I’m in the same boat, I would put another one in the equation for its price: Samyang 12 f2. Although I’m leaning to 16f1.4+12f2 but don’t if there is some redundancy in these focals. HI Carlos. Just FYI, while I don’t yet own the Fuji XF14 reviewed here, I do have experience with the Rokinon/Samyang 8mm Fish-Eye II. I can tell you that, though the Rokinon is a decent performer, in terms of sheer sharpness, I believe that the Fujinons have them beat. A stellar lens. All my other lenses will be gone before this one. What is it with Astro photography? How is the coma? Pingback: ????????????????? 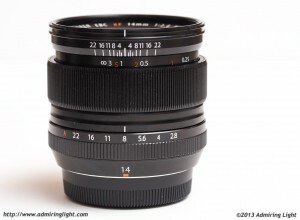 XF14mmF2.8 R??????? | ????????????? Pingback: ????? ?XF14mmF2.8 R????????????????????????????? | ????????????? Pingback: ?????? ?XF14mmF2.8 R? ? ???????????????????????? ?